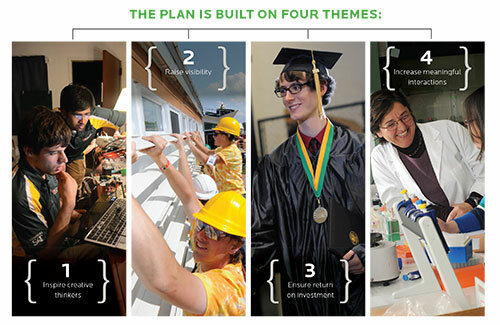 Missouri S&T’s new strategic plan provides a blueprint to ensure that every undergraduate student gets involved in “experiential learning,” along with upgrades in teaching and research facilities, and identifying four best-in-class areas and hiring additional faculty positions. These and other goals will help ensure that S&T offers the best possible return on investment for students, research partners and others, Chancellor Cheryl B. Schrader says.The plan — titled “Rising to the Challenge: Missouri S&T’s Strategy for Success” — is the result of a year-long process involving thousands of faculty, staff, students, alumni and friends. Schrader discussed the plan during her State of the University Address in September. Details of the plan are available online at strategicplan.mst.edu.